Although The Flash in a Warner Bros. shared movie universe may still be little more than a hope, The CW will be testing public interest when they bring Barry Allen to his very own TV series, after helping bolster the cast of Arrow Season 2. While some might see that as a consolation prize, the writers and executive producers of the show feel differently. Early signs have pointed to a more traditional take on the comic book speedster - from costume to character details - and the latest comments from Arrow executive producer Andrew Kreisberg (who will be taking point on the Flash series) imply that the assembled team planning The Flash's live-action debut are more confident than ever. It didn't take long for the announcement of a Flash TV series to get tongues wagging, sparking debate over the shortlist of actors in the running before Glee alum Grant Gustin landed the coveted role. Speaking with FlashTVNews, Kreisberg explained that selecting Grant Gustin to bring 'The Flash' to life wasn't quite as difficult a decision as they might have expected. 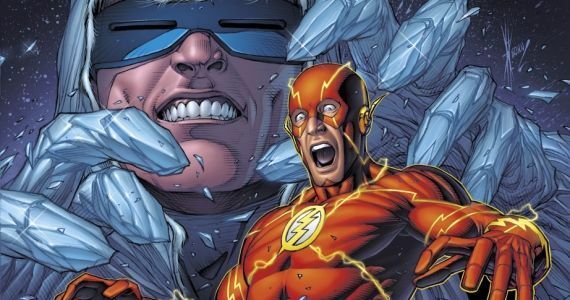 Fans will likely reserve judgement until the episodes in question air, but with Geoff Johns - DC Comics' Chief Creative Officer and one of the most influential, forward-thinking and critically-praised comic book writers in decades - backing up Gustin as a fit for the character, we'd say he gets the benefit of the doubt for now. “With Arrow, we wrote it without anybody in mind. This time, as we were writing these episodes, we cast Grant in the middle of it. “That was different, because now when we go into writing the actual pilot in Episode 20, we already have our guy, and we’ve already seen him on the screen, so hopefully we’ll actually literally be able to look at things and learn." “Barry’s a fanboy. He comes to Starling City and he says to Felicity, ‘so I heard the vigilante saved you. What’s he like?’ So I think for Barry, it’s one of those things where it’s sort of like ‘be careful what you wish for.'" The announcement that The Flash would be uniting with Green Arrow on TV screens sent the hopes of every Justice League fan soaring, but with the task of introducing Barry, developing him pre-superpowers, and writing what Kreisberg confirms will be a backdoor pilot for his own TV show coming in Episode 20, an authentic team-up between the pair of heroes is at least a season away. “If you look at the Justice League, you have Superman and Aquaman and Wonder Woman. You have all these gods. And then you’ve got Barry Allen, who’s just a guy. That’s, I think, why the character appeals so much to Greg and to Geoff and to me, and it’s also why he’s a really good fit to the world of Arrow, because while we’re obviously introducing some fantastical concepts to things, we want to still keep the show as grounded and realistic as possible. It's far too soon to discern what Kreisberg could mean by those comments, or what 'unbelievable' crisis might be affecting Central City (but then, a massive plot to erase part of a city was handled surprisingly well in Arrow). It IS the right time, however, to decide if a heightened, perhaps more 'comic book' mythology could work around a character as unique as The Flash. What's your take? Does the relationship hinted at between Ollie and Barry scream small-screen success to you, or does the idea of blending tones down the road seem like an accident waiting to happen? Share your thoughts in the comments.